Picture of the dog rescued by the Ross County Humane Society in Ohio by Jenn Thomas, the shelter's Executive Director. Last Friday, the Executive Director of Ohio’s Ross County Humane Society, Jenn Thomas, woke up to terrible news. It’s “7:00 am and the people of our community have not ceased to amaze me and not in a good way,” Thomas wrote on her Facebook page, referring to the abandoned puppy just found left in a cage. Thomas’ outrage didn’t stem just from finding an abandoned puppy so early in the morning, which unfortunately, is a common occurrence across the states. She was also angry at how the puppy was abandoned. Someone had written “free,” “good home,” and some other unintelligible words in permanent marker all over its fur. Picture by Jenn Thomas, the Executive Director of the Ross County Humane Society. This little puppy symbolizes a much bigger problem. Around 2.7 billion companion animals are euthanized every year because of human negligence. When animals aren’t spayed or neutered, they reproduce. Sadly, instead of caring for the offspring, many people mistreat and abandon them. Even though shelters try to place rescued animals with good families, many simply can’t keep up with the numbers and end up euthanizing a significant portion. Yet all of this suffering is unnecessary. If humans were kinder and more responsible, companion animals wouldn’t need to be rescued and they wouldn’t be euthanized. The people who abandoned this puppy may have had “good” intentions in the sense that they expressed the desire for the puppy to find a good home, but the way they went about it was entirely wrong. This isn’t the first time someone has abandoned a puppy this way. Last year, someone in Philadelphia left a puppy tied to a handrail in front of an apartment building with a note and part of a pizza for food. Although both of these negligent owners expressed the desire that the puppy find a happy family, it’s clear that many people don’t understand what it means to be a good owner and lack education about the community resources available to animals. Getting an animal spayed or neutered can be surprisingly easy. Many nonprofits offer reduced costs for community residents and many free programs also exist. In fact, the Ross County Humane Society offers several free spay/neuter clinics throughout the year to low-income residents. There are also shelters that do not kill any of their animals. Although it is understandable that some pet owners want to breed their animals, there is such an overpopulation of dogs and cats in the United States, breeding really isn’t necessary. Shelters across the country are currently housing 6 to 8 million animals. Instead of breeding more dogs or cats or buying from heartless puppy mills and the pet stores that fuel them, people could easily stop this horrendous trend in animal suffering and death by spaying and neutering and buying only from shelters. Buying from a shelter doesn’t just help benefit an abandoned animal. Most shelter dogs already come neutered or spayed and have all their shots. You’ll help save an animal’s life and make space for another. 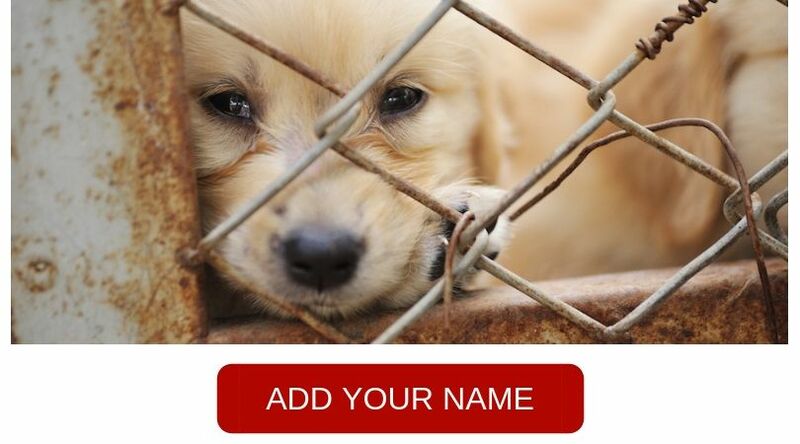 If everyone got their dogs from a shelter, the demand for puppy mills would dry up and they’d cease to exist. To top it off, adoption fees are often far less than buying from a shop or breeder. As for the Ohio puppy, she’ll get the treatment she deserves from the Ross County Humane Society, and eventually find a much better, more responsible forever family. “The loving staff is working on getting her cleaned up and she will not be FREE but we will make sure that she gets a good home,” Thomas concluded. This is very sad but at least the owner didn’t discard the puppy in a dumpster or freeze her or burn her to death, etc, as many people do to their animals when they decide they don’t want them anymore. Spay/Neuter laws need to become MANDATORY in ALL states, or else we will continue to read heartbreaking stories like this one. Yes, abusive to write on that perfect white lab pup. Better off without them. Good idea to reduce or spay free. Who are the vets out there willing to do this? Please start!! 2 billion pets a year put down due to no homes is a sin. When I read stories like this it just breaks my heart. I know why they do this — it’s because they can’t bear the responsibility of taking an animal and turning it over to a reputable Humane Society they take the cowardly way out and abandon it. If I was a wealthy person there would NEVER be a homeless animal — I’d see to that. These poor things are just thrown away like trash for someone else to take care of. MORAL TO THE STORY — If you can’t commit for the life of an animal then don’t get a pet. Reflects the appalling vile Pet Industry built on OVERBREEDING OVERPOPULATION of pets to fill the pockets of STAKEHOLDERS! SHAMEFUL INCOMPETENT sick industry ! WHAT A SHOCKING WAY TO ABANDON THIS POOR PUPPY ! THANK GOD SHE WAS FOUND & HAS BEEN TAKEN CARE OF….NOW SHE NEEDS A NEW CARING PERSON TO LOVE HER FOREVER. I BELIEVE THAT MAKING THIS POINT THROUGH SPEAKERS AT THE GRADE SCHOOL LEVEL UPWARDS WOULD MAKE A HUGE DIFFERENCE. HOPEFULLY SOME FOLKS CAN FACILITATE THIS HAPPENING…. GOD BLESS YOU PEOPLE FOR WHAT YOU DO FOR THESE HELPLESS ANIMALS. Exactly Butch, there has GOT to be more education across the board, and the younger they’re taught, the better!!! With that said, it boggles my mind how much of a lack of education there is, and more so, a lack of empathy, and just knowing right from wrong. More charges need to be imposed for animal neglect and cruelty. Puppy mills and breeding should also be banned. There also needs to be more collaboration between pet stores and shelters-pet store should NOT buy animals-period but should just allow adoptions with the shelters. Pet Store should also stress and incorporate spaying and neutering to anyone coming in buying pet supplies. More free or low cost clinics also need to be established or a requirement for Vet clinics to do business in an area-they must supply resident with low cost or free spaying and neutering. this is why FREE SPAY AND NEUTER CLINICS ARE NEEDED WORLD WIDE. Why some people get a dog and just decide they don’t want it anymore is beyond me. Breaks my heart when I hear that so many lose their lives because of incompetent, ignorant people. It seems dumb not to adopt a dog. Not only are you saving a life, but you are all in all getting a better deal. The maximum a shelter can ask from someone adopting out a dog is 250$. Taking into consideration that some pet shops ask for upwards of 1,000$ to purchase a dog and adopted dogs are already spayed and neutered, the cost is absolutely a plus to adopting a dog. On top of that, you are saving a life. Some people buy dogs because they want a pure bred dog. However, research has shown that “mutts” live longer. In fact, you can even adopt a dog that is a single breed from a shelter! All ages of dogs are often available at shelters, and if you adopt you can save a life!! On the other hand, abuse like what’s mentioned above is absolutely disgusting. Shelters usually can take dogs, but even if they can’t, there are hundreds of better ways to go about getting rid of a puppy. Terrible but wishing this pup a bright future with a loving, forever family. This act is just plain stupid! I hope this beautiful pup can find a fabulous forever home, but for someone to mark the pup up like that doesn’t help. People this stupid shouldn’t be allowed to vote! Just saying…..
so sick of the animal abuse going om all over the world. these kind of people are soulless. if you do not care for the welfare of poor little helpless animals how can you care for or love anyone. please let me know if she finds a loving home & if she doesnt i will still have her please let me know if she finds a forever home altho i have a fully grown male cat . if no one has her i will my email address is [email protected] please let me know altho i live in England. Blessings to the rescuers ! Prayers for this sweet baby to find a loving and responsible furever home ! Hope you find a loving home soon, beautiful pup ! Love you pup ! “Good home only”… meaning NOT like the one this little guy just came from. There is an old saying:”if you cannot do with manners, do it with stick”which means” if one doesnot understands with words, so the best way for him to understand is by force!!! LAW IS THE ONLY WAY, every animal MUST BE SPAYED, and the vets will be obliged to enforce the law. No spaying?? ?No vaccin+ no treatment+no health book!! !IT IS AS SIMPLE AS THAT!!! Thi is shocking! If humans were kinder and more responsible, we wouldn’t have to push so hard to make sure abusers pay for they do! Totally ignorant. This is the way animals end up in a bad situation. Also, I don’t think it shows much concern by writing all over the puppy. How about using a marker and paper and encasing it in a plastic sleeve (at least)? People think it’s fun to have a puppy until they realize it needs to be taken care of. If a person is not going to take in an animal and give it a forever home and treat it like family, then that person shouldn’t be a pet owner. I guess all I can say is that in a day and age in which people leave a 4 year old child at home unattended to run an errand and play Pokemon Go, then that 4 year old child is rescued by a Good Samaritan “Spiderman” in Paris, then it is fortunate that the puppy was not tortured & dismembered. I am happy for the sweet puppy that s/he has found his/her way to a better situation in Ross county, and hope for the best for his/her future. May the same be true for other rescues. It us just as easy to take animals to a shelter as it is to dump them. It us much kinder. ?????? It was irresponsible for whoever dumped the pup, but it looks like they at least wanted people to know the puppy was unattached and needed a home. Doesn’t make it right, but marking the puppy, at least was some hint of concern. The marker will eventually wear off. Why write all over the pup? Take a few minutes to hand in animals and then their medical history can be recorded.